Hi everyone. As expected, the tropics are finally starting to become more active as we head into late August. I have been tracking a tropical wave located east of the Lesser Antilles for the past week or so. Just this morning, the National Hurricane Center upgraded the wave to a tropical depression (9). I imagine by tomorrow night, Tropical Storm Isaac will be born and will strengthen into a hurricane later this week. The major debate associated with this storm is whether it will continue its westerly track and stay south of Hispaniola, Puerto Rico, and Cuba, or take a northward turn, becoming an Irene 2.0. Anybody living from Florida to New England should be watching this storm very closely. Isaac has many similarities to Irene position-wise and strength-wise. The high pressure setup is also favorable for a EC landfall as well. Many of the forecast models are showing Isaac moving south of Puerto Rico and Hispaniola, then taking a north turn toward Florida. Where Isaac makes the turn is becoming quite a debate between forecasters. 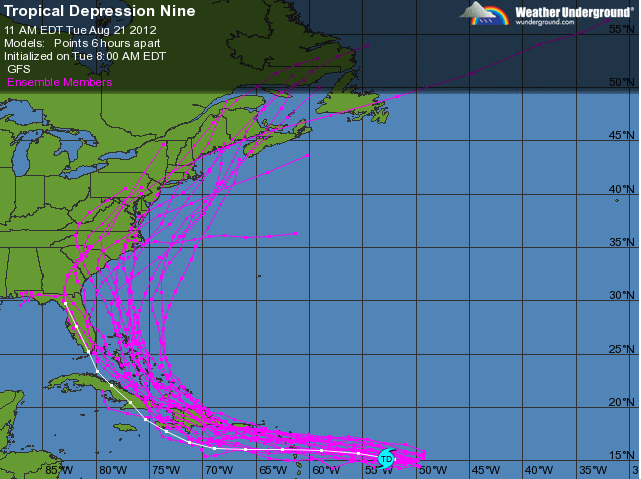 Many of the models are disagreeing exactly where Isaac turns northward. The NAM is showing the turn over Hispaniola, while the GFS is showing the turn over Cuba. Even though it seems that most models are in agreement in the short-range, Irene proved to us that hurricanes seem to defy the forecast models especially during their strengthening phase. Last August, Irene looked like she was going to stay south and head into Florida before turning NE out to sea. As Irene moved closer and closer to Puerto Rico and the Lesser Antilles however, a more northerly track looked likely; one that would affect the Eastern Seaboard. That’s the scare with TD9/Isaac. I am not confident in the track Isaac will take until he reaches the Lesser Antilles and Puerto Rico. Until then, I urge people to continue to stay with Philaburbia as I will be doing some video updates with model analysis over the next few days.